We help Houston’s fitness community recover from injuries and eliminate pain without slowing down, missing workouts or living on pain killers. Submit your email to receive your free e-book! 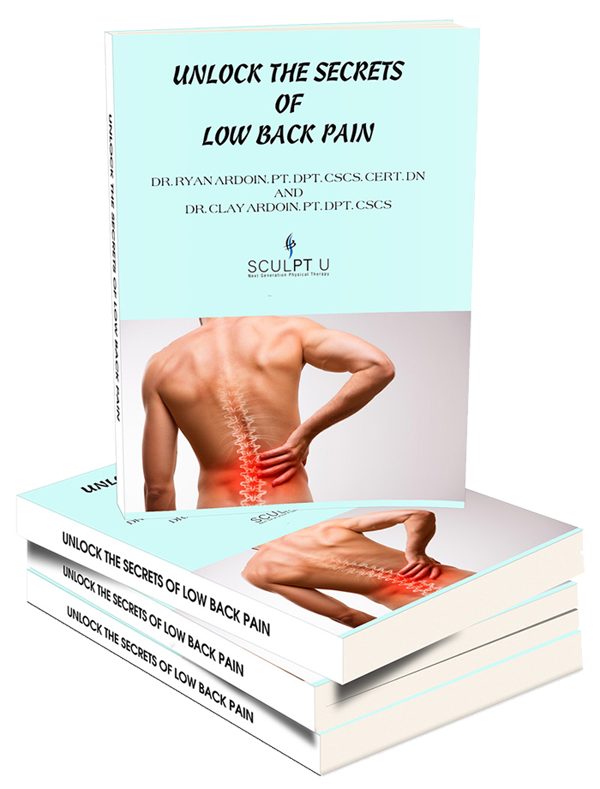 Dr. Ryan and Dr. Clay have collaborated to write their newest book, Unlock the Secrets of Low Back Pain. 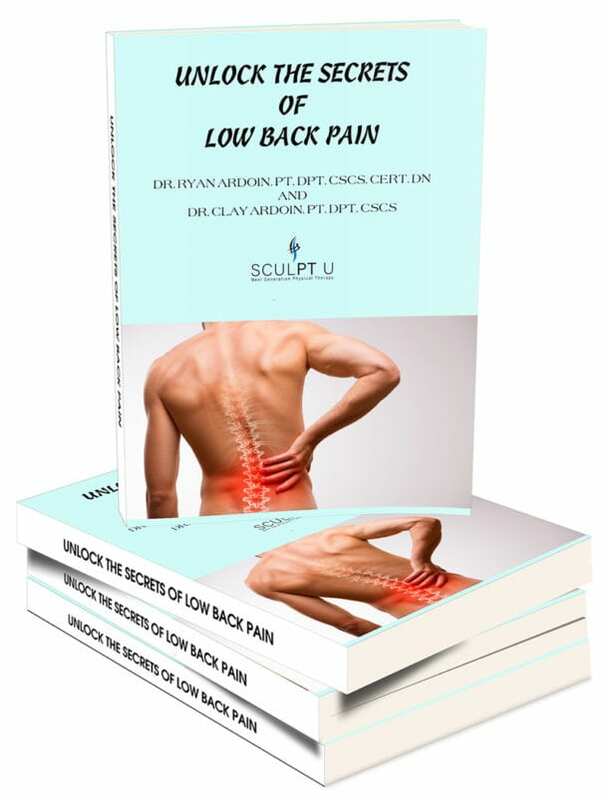 It is an easy-to-follow guide, full of all the important information you need to jump-start your recovery to back pain. Promotion only for a limited number of subscribers. Sculpt U is a effective PT provider. Dr. Clay Ardoin is courteous, professional, thorough, and accessible. If you need PT, you should definitely consider Sculpt U.
Dr. Clay was one of the most caring compassionate and knowledge people that I have ever worked with. I was so scared and freightened I was not going to get my shoulder function back after my surgery but my worries were quickly set aside when working with Dr. Clay. His programming incorporates not only the rehab protocol but took my goals into consideration from the very start. I am very active and my lifestyle is rough on the body. I know that I have found my go to therapist and clinic (SculptU) for the rest of my life. He’s not to hard on the eyes either. Thank you so much Dr. Clay!! I highly recommend Sculpt U based upon my own experience with Dr. Clay Ardoin. Clay made me feel comfortable from my first visit for an initial assessment through multiple therapy sessions completed in November 2018. I looked forward to each visit and found the strengthening exercises he taught me to be very beneficial. Clay made each visit enjoyable and I appreciate his offer to help with any follow up questions anytime I want to swing by. The convenience of Sculpt U located within Fit gym is also terrific. Best physical therapy clinic I have been to so far. I had been seeing another doctor and was not happy with the treatment there at all for almost a year. The difference between the two facilities and way of practice is unquestionably HUGE. Dr. Clay is with no doubt an expert in his field. I have had chronic baker cysts for 2 years in both knees. Dr. Clay is always one on one with his patients verse other offices were they had assistants sub in and weren't very attentive. He also incorporates workouts that compliment the rehab process, which is extremely helpful if you are an athlete. I highly recommend him and his practice. You definitely will not be disappointed. You have successfully submitted your request for our FREE e-book! Please check your email for more information.